Alright, so it’s not exactly the night before Christmas, but for techies like us here at Redmond Pie, it’s the next best thing. With tons of new software releases from Apple today, we now take a look at the just released Cards app which enables users to design and send greeting cards through their iOS devices. The idea around the Cards app is interesting. Cards will allow you to make greeting cards in an iPhoto-esque manner and sent to whomever you choose. Much like Moonpig or Hallmark’s online greeting card services, you can choose from a range of designs (21 in all, both debossed letterpress and flat), and add your own text and images to add that real personalized touch. Whilst sending cards in the mail seems somewhat retro in this digital age, the push notification you will receive to confirm the delivery put everything into digital perspective. 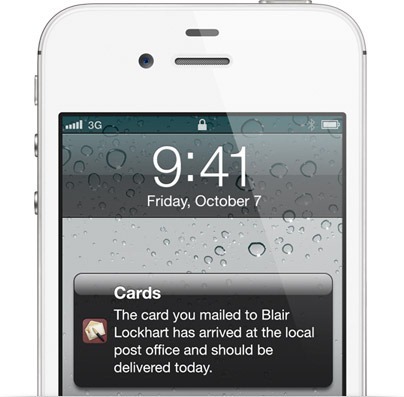 The new Cards app from Apple lets you create and mail beautifully crafted cards personalized with your own text and photos — right from your iPhone or iPod touch. Take a quick snapshot and with a few taps and swipes, an elegant thank you note or “wish-you-were-here” card is on its way to any address in the world. Choose from 21 designs and customize your card with a personal message and photo. Then select an address from your Contacts and place your order in seconds. All your cards are saved automatically, so it’s easy to send an invitation or birth announcement to more than one person. The app will be free, although sending mail obviously won’t be. It will cost $3 to mail to anyone in the U.S., and $5 internationally. Certainly sounds like a job for Siri, doesn’t it? Cards app for iPhone can be downloaded from iTunes’ App Store.